Over the last few weeks my family has been Crepe crazy. I’ve been making crepes of all kinds sweet and savory. I must say, out of all the crepe recipes I’ve been testing, this one has been our favorite! 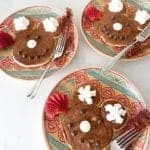 Here’s another perfect Mother’s Day Brunch recipe for you where I use the beautiful pink KitchenAid Blender to help make my crepes. Be sure to check out KitchenAid and Cook For The Cure for a wonderful cause! 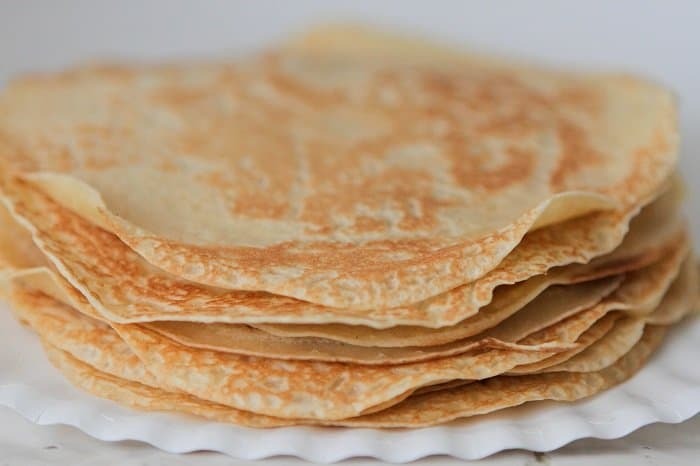 Now, if you have never attempted to make your own crepes, do not panic, they take a little practice swirling your pan, but once you get it, you are whipping up crepes in no time at all. I use an inexpensive crepe pan with a very shallow rim that makes it nice and easy to flip your crepes, but I have certainly made crepes in a regular skillet as well. So no worries! Alright, let’s take a look. I prepare my crepe batter in my blender, which takes a whole 15 seconds. It’s wonderful! Stay tuned for Friday’s Giveaway where you can win a gorgeous Pink KitchenAid Blender of your own!! 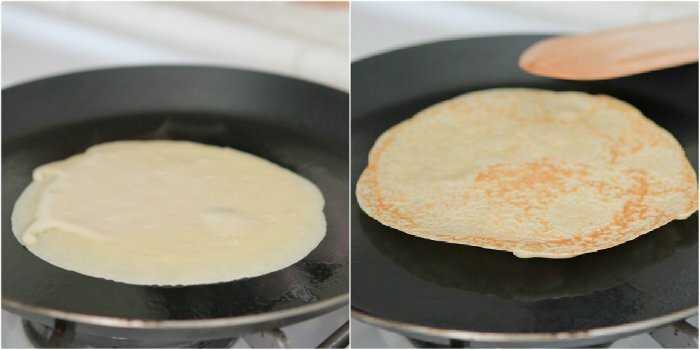 So the trick with making crepes is as soon as you pour your batter into your hot skillet, you swirl it around so your crepe is thin and round like picture 1 on the left. It takes a little practice, but I assure you it’s very easy once you’ve got the hang of it! After about 30 seconds to 1 minute, you flip to cook both sides. The whole stack of crepes takes about 10 minutes. Yippee! Let’s start the blueberry sauce. 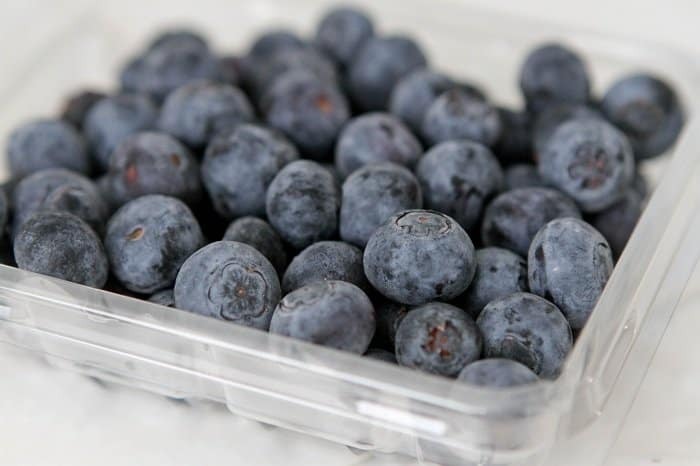 Take 1 cup of beautiful fresh or frozen blueberries and place them into a small saucepan. You’ll add some sugar, cornstarch and lemon juice. Cook and stir until you get a bubbly thick, sweet gorgeous sauce like this. 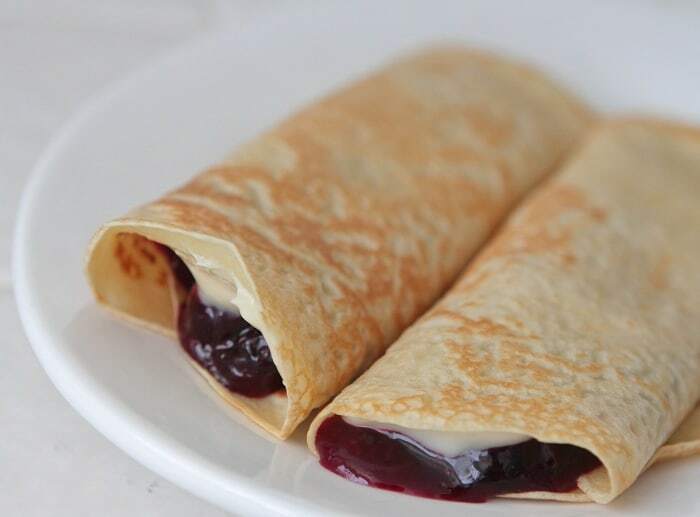 Let’s layer our crepes with a thin layer of lemon cream then top with a small spoon of blueberry sauce. Roll em’ up then go grab some powdered sugar to make it look pretty and fancy. Dust with powdered sugar using a small strainer (or your fingers if you don’t have one) and voila’! How gorgeous and simple is this?! Love it. 1. Place flour, sugar, milk, egg and vanilla into a blender, blending until well combined, about 20 seconds. Pour crepe batter into a large measuring cup and set aside. 2. 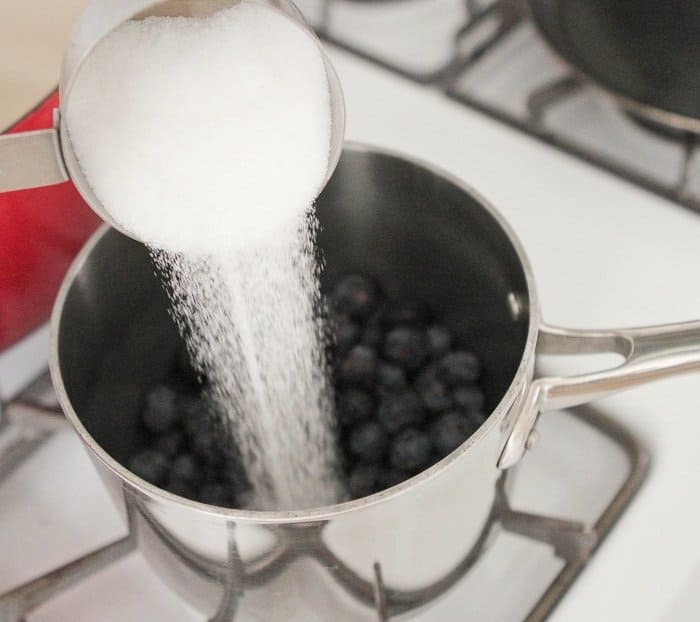 Place blueberries, sugar, cornstarch and lemon juice into a medium bowl, mixing to combine. Transfer to a medium saucepan over medium low heat. Stir and cook for 5 minutes, until bubbly. Remove from heat and set aside. 3. 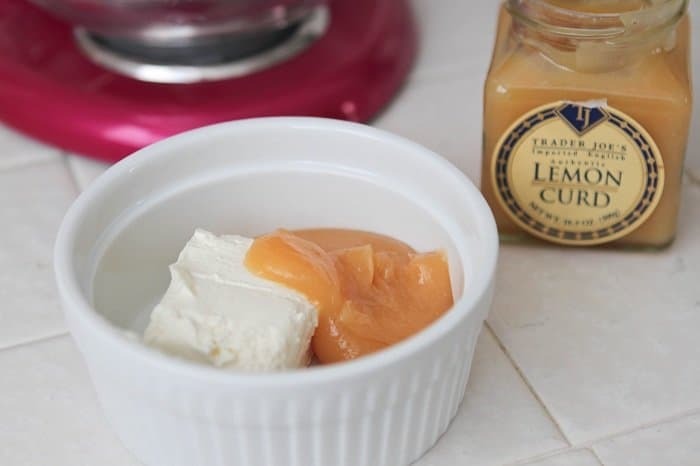 Place lemon curd and cream cheese into a small bowl, mixing until smooth and combined. 4. Heat a crepe pan or 12 inch non stick over medium heat. Spray lightly with cooking spray. Pour 2-3 tablespoons of crepe batter into pan swirling all the way around to get a nice circular crepe. Cook for about 1 minute on the first side or until turning golden then flip and cook for another 30 seconds-1 minute. Transfer to a paper towel lined plate. Continue cooking crepes until all the batter is gone. Makes about 10 crepes. 5. 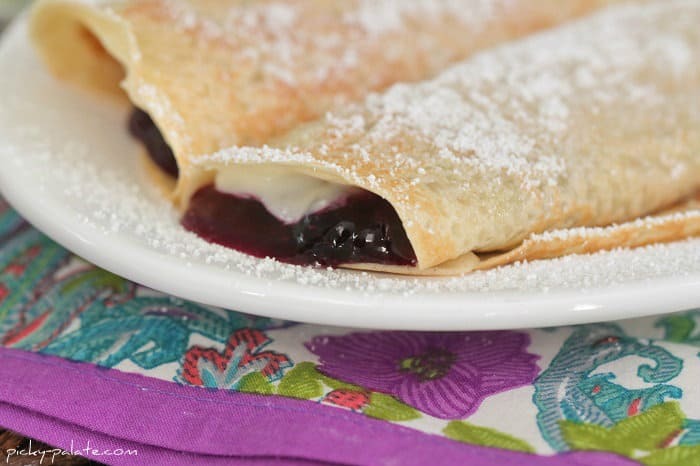 Fill each crepe with a thin layer of lemon curd cream and a spoon of blueberries. 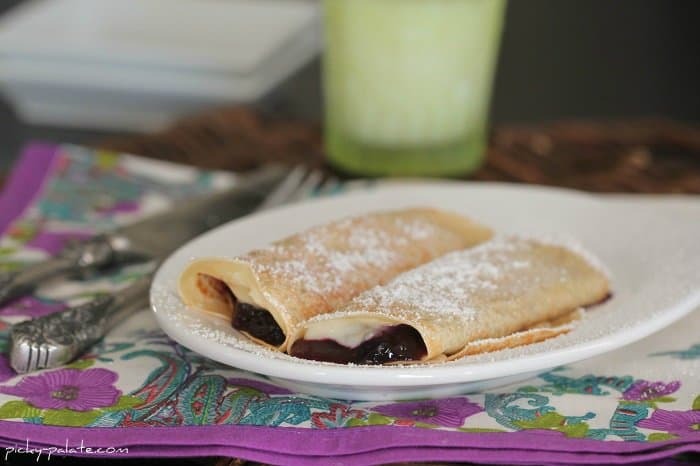 Roll crepes and sprinkle with powdered sugar. Now eat! Oh my gosh! That lemon curd mixed with cream cheese?!? Then put together with the blueberry sauce?!? That sounds just heavenly, Jenny! 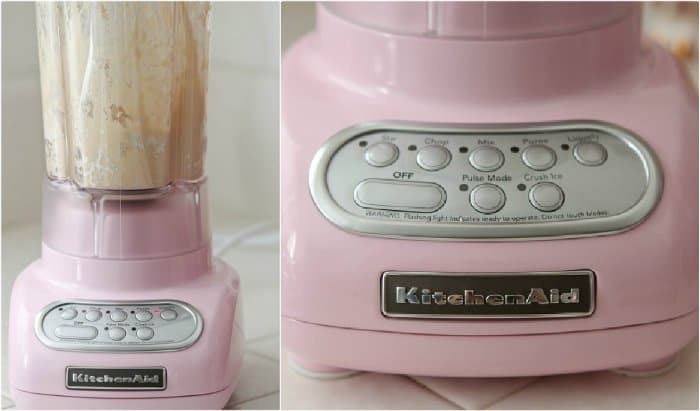 And, that pink blender is adorable!!! So pretty and tasty looking too! I’d be a happy mother for sure. All I can say is WOW! That looks delicious. 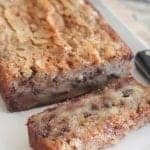 I pinned this recipe immediately and cannot wait to try it. That pink blender? Adorable! I’d be very happy with these for Mother’s Day! 🙂 And that lemon curd + cream cheese is brilliant!! these look delicious Jenny! I need to find that prepared lemon curd in my store. My mouth is salivating just looking at the pictures! 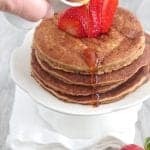 I’ve attempted crepes once before and it was an epic fail–might need to give these another try! I really have no words for how delicious those crepes look. Amazing. If I print this recipe out and leave it in the kitchen, I wonder if someone will make these appear for Mother’s Day? 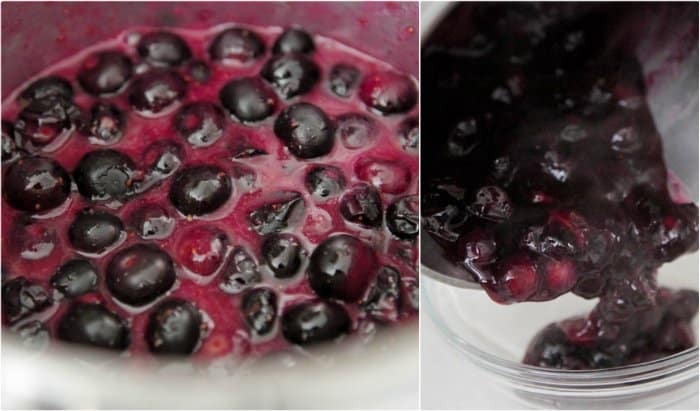 I love this kind of blueberry sauce…so perfect for lemon curd too. The crepes look amazing, Jenny! lemons and blueberries belong together! I really should try making crepes sometime. I have always wanted to make crepes…I have always been a little scared because I am the wold’s worst pancake maker. I need to get over it because these look amazing! This looks delicious! I’m always up for a new kind of crepe. Boy, how I wish these were my breakfast this morning, not the boring bowl of cereal I actually had! I just might have to make these for the fiance this weekend! I have always been intimidated by crepes but you make them look easier! Any type of crepe is great. Thanks for the recipe! Does anybody know if crepes work with cast iron or stainless steel pans? I don’t have a nonstick pan, and I’m assuming that’s what you used here. I always use a stainless steel pan. Just make sure you spray with oil before every single crepe or you will end up with scrambled crepes! I don’t use non stick because the coating flakes off in your food. Growing up we always used the cast iron for making crepes and it works fine too. Just remember the handle gets hot so use a hot pad. And it is heavy so I prefer the stainless steel. Oh what I wouldn’t give to have someone make me a batch of those right now!! Yum yum! 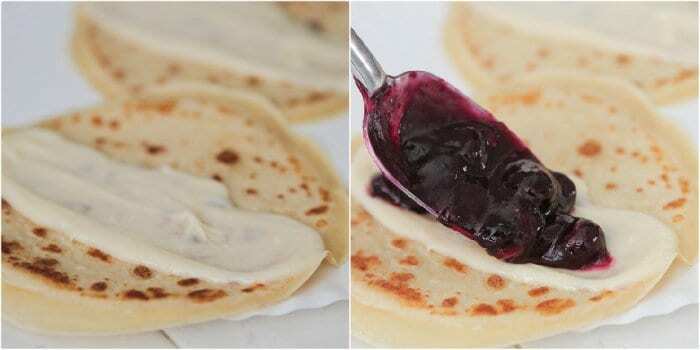 My mom requested Swedish pancakes for Mother’s day breakfast so this is what we were making, but I was going to fill them with strawberries, and now I’m going to surprise her with this combination. It looks amazing! I love love love crepes! I haven’t made them in YEARS but I’ll keep this recipe bookmarked. Blueberry and lemon are my favorite fruity combo! I love crepes!! This looks so awesome! 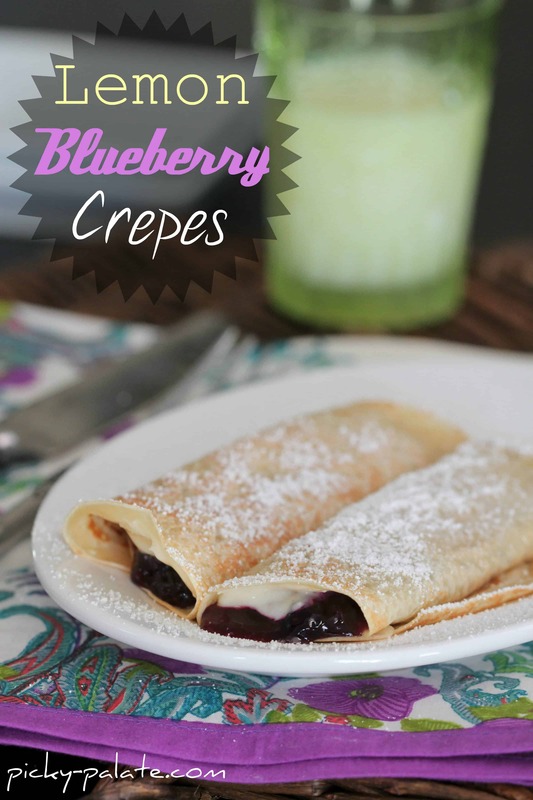 I love blueberry-lemon anything and I’m sure I’d love these crepes! They look perfect, Jenny! D: SOUNDS SO GOOD!! i love lemons, blueberries, and crepes! We have been crepe fanatics for years. The look great. Will you share a savory crepe recipe? I have never been brave enough to try one. And haven’t really found much in the way of savory recpes. Cream cheese and lemon curd? Girl, you are a genius – these look absolutely perfect. My goodness, what stunning pictures! They are some of your best! LOVE the lemon curd mixed with the cream cheese! I have been lemon curd obsessed lately, and this sounds fantastic. Does the melted butter go in the crepe batter?? These look amazing! Never tried making crepes but I’ve always wanted to so I’ll be making these for all the moms in my life this weekend. One question, though: I’m not a huge fan of blueberries so I bought strawberries. Can I sub them in the sauce? Crepes are one of my favorite things to eat for breakfast! I want this right now!!!! Crepe batter is exactly what i like. Thank you for that article. I enjoyed reading it. Thanks, Victor! Where does the one tablespoon butter go? I wanna make this ASAP…. Thanks! Awesome photos as usual. It goes in the crepe batter in the blender 🙂 Thanks! Made these today following the recipe but batter was very thick. Batter should be consistency of heavy cream but was coming out like cake batter. I modified by adding a 2nd egg and another 1/4 cup of milk.and it came out just right.